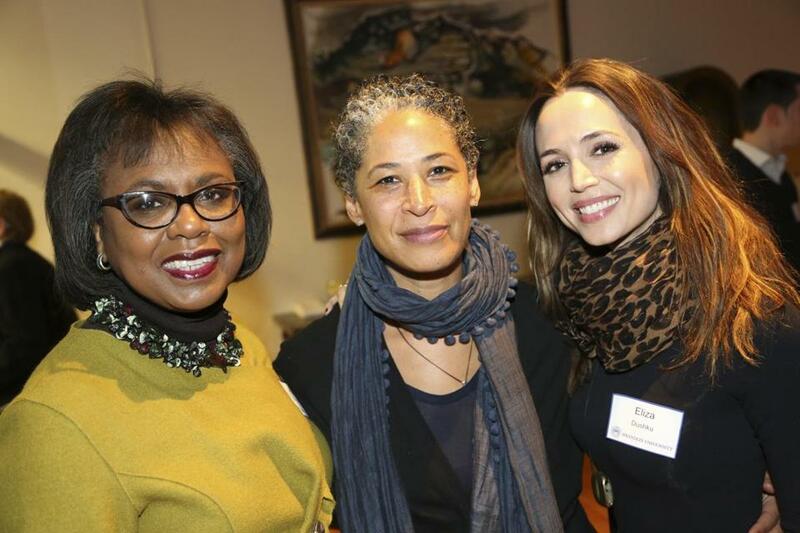 From left: Anita Hill, Rebecca Walker, and Eliza Dushku. Writer Rebecca Walker, whose books include “Black, White and Jewish: Autobiography of a Shifting Self,” “Enduring Violence: Everyday Life and Conflict in Eastern Sri Lanka,” and the novel “Adé: A Love Story,” was the keynote speaker at ‘DEIS Impact 2017, Brandeis University’s social justice festival. Walker (center), daughter of Alice Walker, delivered an address called “The World in You and You in the World: Identity in Action.” Guests in the audience included Brandeis University professor Anita Hill (left), Suffolk associate professor emerita Judy Dushku, and Dushku’s daughter, actress Eliza Dushku (right). The Dushkus gave the ‘DEIS Impact keynote in 2013 about their work with THRIVE-Gulu, an organization that helps communities in Uganda. Walker was expected to stay on campus Wednesday night for a screening of an episode of Amazon’s “Transparent” (she appears in the episode.) ‘DEIS Impact 2017 runs through Sunday.